When we went to Young a couple of weeks ago, we sort of jumped the gun. A variety of other plans throughout the week got shifted, so we ended up with a free Saturday and we really wanted some cherries. So off we went. But, we knew we would have to go back because we had already been planning to attend the Young Cherry Festival. That event was this weekend, and good timing, as we had finally eaten all of the cherries from last time (well… except for those that we made into chutney; we still have a few jars of that in the freezer). First stop was Ballinaclash, where we harvested about 10 kg of lovely red fruit. This time it wasn’t as easy; we’re not sure if it is because of the time of year or something to do with the weather, but the trees had a lot of bad cherries. And there were a lot more people. But we lucked onto a really great tree and pretty much both filled our buckets from it. Thought we did get a 750 gram piece of cheese, we reckon we maybe should have bought a bit more because he sells it for $25/kg. That is really cheap for here! We might try to track him down for more. On the way out of the parking lot, we stopped to chat to an elderly Italian gentleman who was selling olives and cheese from his caravan. Both of these were produced from 5-generation-old recipes that he brought with him from Italy. He’s been in Young for 0ver 30 years, where he has an olive grove and 50 goats. 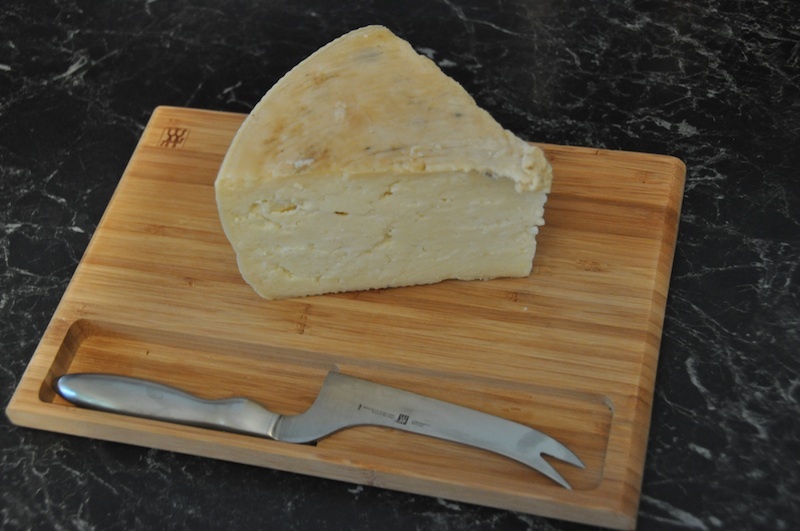 He cures olives, presses his own oil, and makes an amazing semi-hard goat’s cheese. And he sells them at give-away prices! He also said he makes ricotta and feta, but can’t do that right now because the goats are pregnant so he can’t milk them. We just love hearing stories like this, and meeting these wonderful people who produce artisan (or should we say rustic?) foods because they love doing it. He kept saying to us “You won’ta finda cheese/olives like this anywhera else. I make from love, not business.” He learned the craft as a small boy, from his grandfather. Then, into town for some pie (a lot of pie, of various types), and the festival. Because we were in a bit of a hurry, we went straight to Wilder’s Bakery where we bought some cherry pies (2 small ones for our dinner, and a large one for Lisa to take to tea one day at work) and some sausage rolls for lunch (sort of pies…). Here in Australia, you see people walking down the street eating sausage rolls, hot meat pies, sausages wrapped in white bread… all sorts of meaty/doughy combinations. We decided to do as the Aussies do, eating our sausage rolls as we walked to the carnival grounds. This was a big challenge for Lisa who a) thinks all pies should be eaten with a fork, napkin at the ready, and b) doesn’t really understand the notion of encasing sausage meat in pastry. The Young festival had the usual attractions: a display of vintage cars (including some cool, 1950s caravans to match! ), grey-haired ladies selling crocheted baby booties and marmalade, and the local choir. However, this event also had a Cherry Queen (sash and all!) and a ‘Charity Queen’ (we were wondering if this was a polite title for someone who wasn’t good enough for the real competition), an annoying clown named Milo (who gave this man a microphone? ), and 23 buskers (we know this, because there was a competition). Not your typical small-town Aus festival goers. These back-packers were waiting for the drum solo in the choir performance. 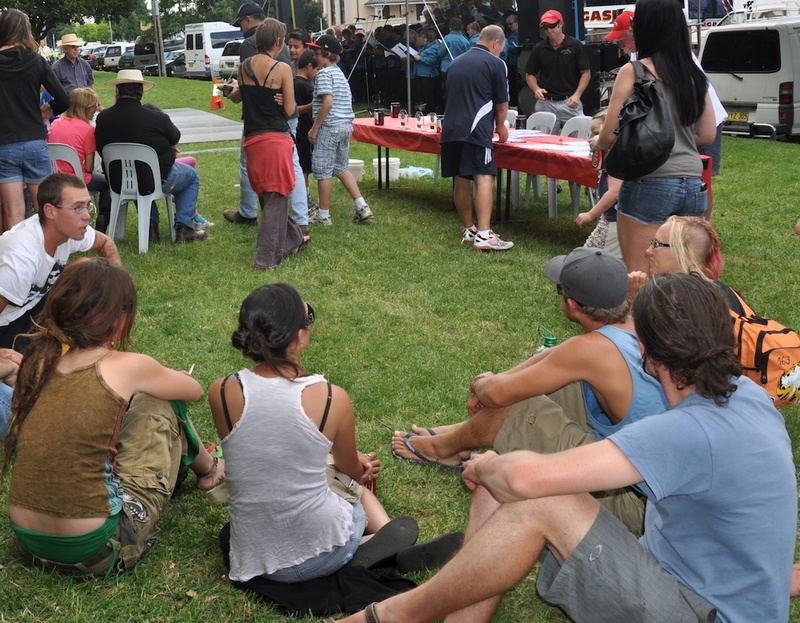 This festival also drew a very different audience; yes, there were your typical Aussie families (from grandkids to grandparents), teens with nothing else to do on a Saturday in a small town, and lots of people saying “hoy” to those they knew. But there was another group of people we’ve not yet encountered — migrant workers. Now, these aren’t your typical migrant workers (i.e., for those readers in Southern Ontario, you may be familiar with Mexican workers who come north in the fall to pick apples). No, these were hippie travelers from France, Brazil, Korea… and yes, even Canada… in town to pick cherries. This festival was kind of like a multicultural Grateful Dead show. The punk guy (not Sebastien, who we mention later, but Mathieu) was from Quebec. Dan would have thought the Buzzcocks logos on his jacket were cool if it was still 1979. The juice jug was full of goon, being refilled from a bladder in his girlfriend's knapsack. He said he drinks about 5 l of it a day. Dan gave Milo, a whole bunch of Young'uns, and a crowd of international pickers a lesson on Canadian iconography and tattoo artistry. But, when he was settling into his seat for his heat, Dan showed his true colours, literally. He stepped a couple of seats over, tapped a Quebecois picker (Sebastien) on the shoulder, pulled up his sleeve exposing the Inukshuk tattoo, wished his fellow Canadian good luck, and sat down. 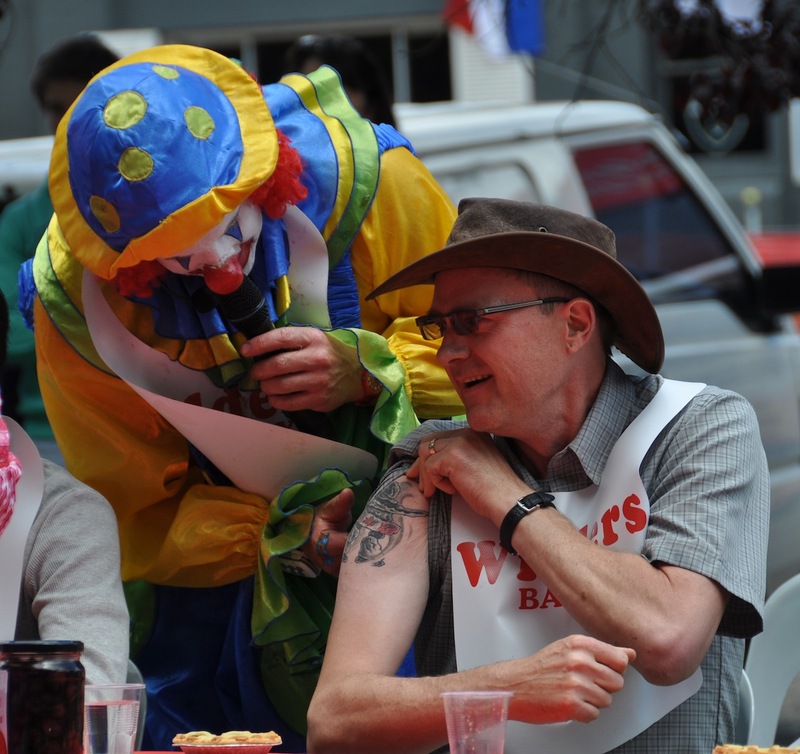 This intrigued Milo the clown (sort of the Cherry Festival equivalent of Ed McMahon) who actually settled down for a while and interviewed Dan about the tattoo, having him show it to the entire crowd (500+ people) and explain the meaning. This got a round of applause from the small cadre of Canadian hippie-chicks at Sebastien’s feet…of course, once the eating started they went back to cheering for their fellow back-packer. When a pie is this good, you don't just shovel it in. Enjoying a free pie is more important than winning. 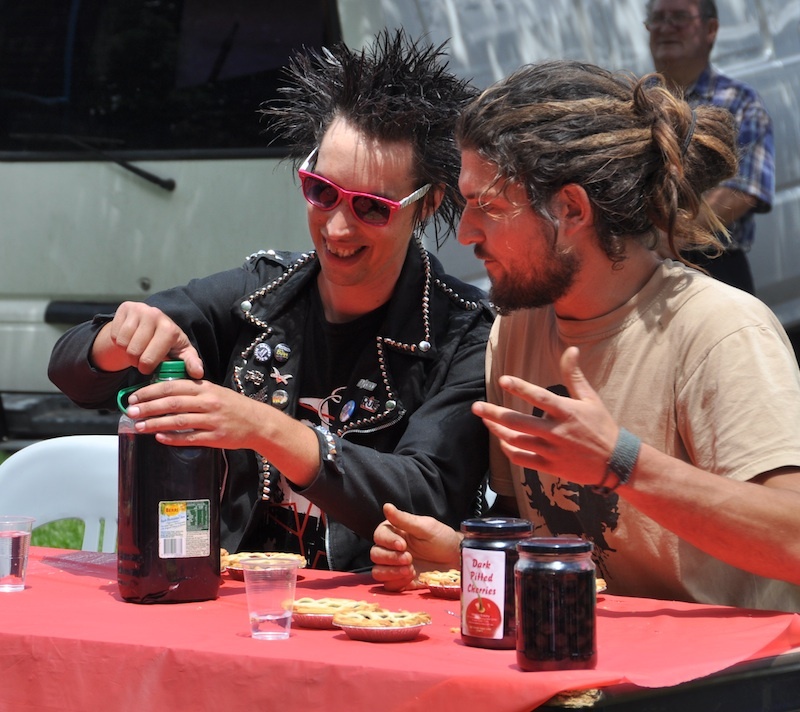 In the end, Dan didn’t win… The format was to eat as many 5″ pies as you could in 2 minutes. The winner of his heat ate 4 whole pies. Sebastien finished 3 and took a couple of bites from the 4th. Dan was slowed down by crunching down on a cherry pit in his 2nd pie (he signed a waiver saying he wouldn’t sue if this happened) but managed to finish 2 and take a bite out of a 3rd. This last bite wasn’t for competition sake – it was just a nicety…the competitors were told to finish one pie before grabbing the next from a pile in front of them. All untouched pies from the round were left for the next heat. 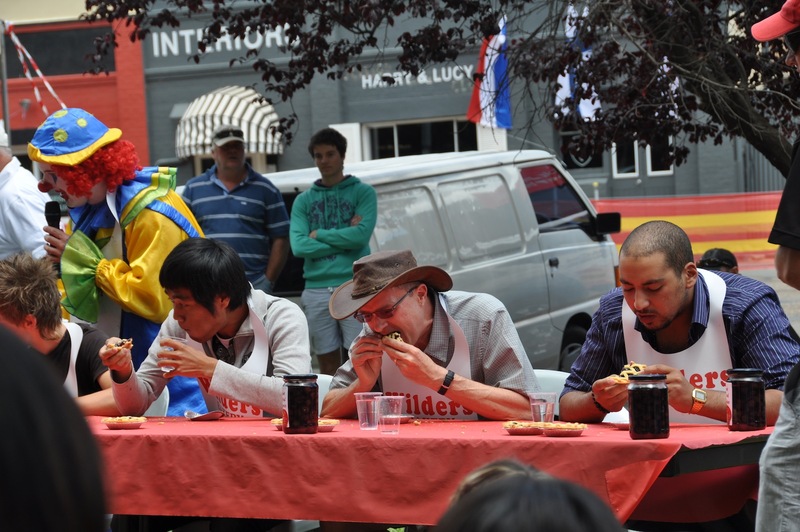 Partially eaten pies…by that point, most competitors just binned them. Dan, however, is a really great husband: he forced himself to bite into the third pie so he could keep it and give it to Lisa. She was the real winner of the competition – no over-indulging, no humiliation, but free pie (despite a bit of Dan’s drool)! Of course, losing didn’t bother Dan. He said right from the start he had no interest in winning (even said this in his public interview with Milo), but was only in it because these pies are from Wilder’s and are really good. And unlike the Ganmain contest where he paid $5 for 3 mediocre pies, this was free! Lisa got the best deal of the day - free pie! Sure it was a leftover, but still yummy! We didn’t stick around to see how it all ended up. Dan was in the third heat out of nine, then there were play-off rounds. 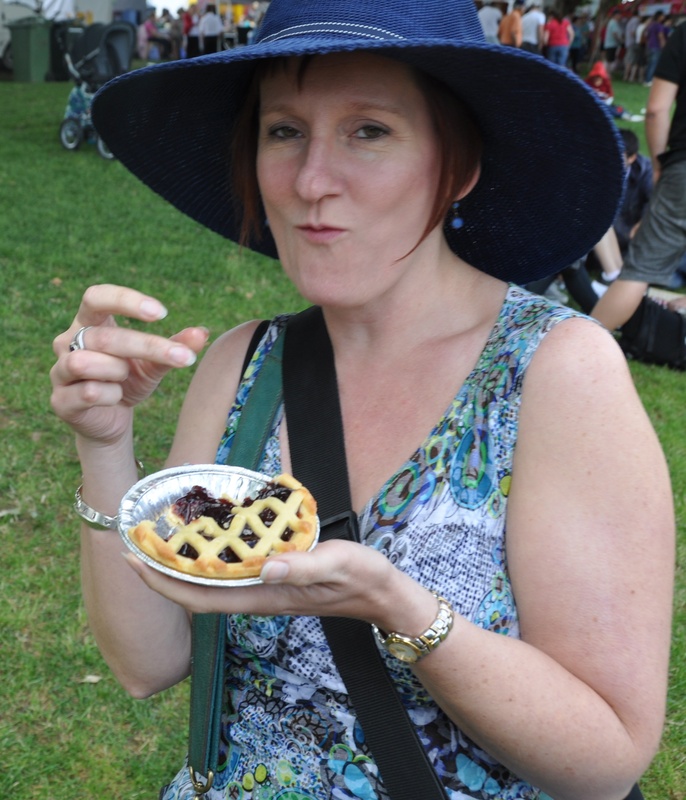 Instead, we wandered through the festival grounds a bit more, then went for lunch…back to Wilder’s for more pie! This time meat (curry chicken for Lisa, rosemary lamb for Dan), again eaten without cutlery. And then headed home, via Ganmain where the Christmas Twilight Market was being held. This was a real small-town event. We bought some marmalade and some tin magpies for the garden, and resisted the free kittens. We also bought some really great brie and camembert from some lady also selling plants. She likes to eat cheese, so learned how to make it. She now sells it to co-workers (would love to work with her!) and thought she should try selling it at this market. Like the Italian guy with his cheese and olives, it isn’t a business, just a hobby. People here have really interesting hobbies…and ones that we are glad to help them out with! Once home we compiled a wonderful dinner of things we had acquired throughout the day and in other local spots: the cheese and olives we had just bought, buns (known as bread rolls here in Oz) from Wilder’s, Harefield pistachios, cabana (an Aussie smoked sausage) from the butcher down the street, dried muscats, a bottle of sangiovese from Tumbarumba that Dan bought at the Jugiong Wine Cellar. Easily a “100-mile meal”. And, to finish it off: more cherry pie. Yum. This entry was posted in agriculture, Australia, Ballinaclash, cheese, cherries, festivals, fruit, olives, pie, pistachios, rural life, wine, Young. Bookmark the permalink.